"Fake news," wild conspiracy theories, misleading claims, doctored photos, lies peddled as facts, facts dismissed as lies--citizens of democracies increasingly inhabit a public sphere teeming with competing claims and counterclaims, with no institution or person possessing the authority to settle basic disputes in a definitive way. The problem may be novel in some of its details--including the role of today's political leaders, along with broadcast and digital media, in intensifying the epistemic anarchy--but the challenge of determining truth in a democratic world has a backstory. In this lively and illuminating book, historian Sophia Rosenfeld explores a longstanding and largely unspoken tension at the heart of democracy between the supposed wisdom of the crowd and the need for information to be vetted and evaluated by a learned elite made up of trusted experts. What we are witnessing now is the unraveling of the détente between these competing aspects of democratic culture. In four bracing chapters, Rosenfeld substantiates her claim by tracing the history of the vexed relationship between democracy and truth. She begins with an examination of the period prior to the eighteenth-century Age of Revolutions, where she uncovers the political and epistemological foundations of our democratic world. 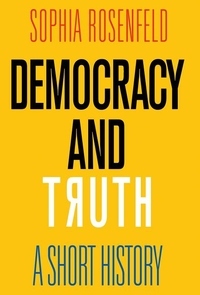 Subsequent chapters move from the Enlightenment to the rise of both populist and technocratic notions of democracy between the nineteenth and twentieth centuries to the troubling trends--including the collapse of social trust--that have led to the rise of our "post-truth" public life. Rosenfeld concludes by offering suggestions for how to defend the idea of truth against the forces that would undermine it.